The Philippines is famous for its beaches, beautiful sunset, and the plethora of shopping malls that you can spend literally all day in. This booming country is filled with malls left and right swarmed with people from all walks of life looking to hang out, shop, people watch, or escape from the intense heat and humidity outside and bask inside the air conditioned shops. Anyway, some of my favorite spots for shopping are..
Greenhills- this place is a flea market style arena where you can bargain and find imitation goods, souvineres, clothes, shoes, jewelry; it has just about a little bit of everything. Glorietta is a mall that fits my lifestyle since it's located in the heart of Makati and is surrounded by 5 star hotels and carries a mix of high end fashion to well loved flea markets. It's divided into 4 sections, and Glorietta 2 carried the majority of my favorite shops in the Philippines until some bombing last year and Topshop is now no longer there. Fortunately, Greenbelt has one and is in the same area as Glorietta which caters to a more high end consumer, but offers numerous restaurants, bars, lounges, and gives a tranquil outdoor atmosphere for shopping. And then there's the Mall of Asia, which is the largest mall in the Philippines and the 3rd largest shopping center in the world. It's huge and you can't cover this place in simply one day, with over 650 shops, a cinema complex, an ice skating rink, restaurants and a monstrous food court, you will not be disappointed or bored. 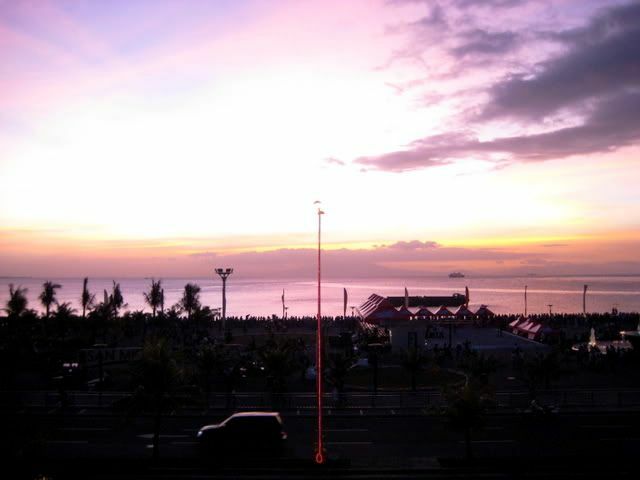 You can view the Manila Bay Sunset and watch the spectacular fireworks show every Friday and Saturday at 7pm.